Have you ever wanted to travel the world and make a difference while doing it? As of Tuesday, Oct. 16, UCSB alumni Daniel Connell, Quincy Lee, and Byron Roos-Collins will be biking across Africa to do just that. The trio will be flying out together from Los Angeles to Cairo, Egypt to start an adventure of a lifetime. The three will be biking from Cairo all the way down to Cape Town, South Africa in order to raise money for their nonprofit organization, Locos Ciclos. With the help of Lee and Roos-Collins, Connell created Los Ciclos: a group that travels in an environmentally friendly way around the world, meeting new people as they go. They aid the development of rural communities by donating the money they earn to the World Bike Relief, a nonprofit organization that donates bicycles to impoverished communities in need of more efficient transportation. So, why bicycles? Bicycles provide increased mobility, allowing users to retrieve and haul essentials such as food and water more easily. Locos Ciclos believes that this is not only the best way to help impoverished people travel, but also a great way to increase a community’s economic growth through educational outreach and professional development. Los Ciclos’ previous bike tour took place in 2017 when Lee and Connell traveled 10,000 kilometers from Santa Barbara to Colombia in six months. On this trip, they were able to donate 45 bicycles through the World Bike Relief. For their upcoming trip, the group’s goal is to travel 14,000 kilometers in roughly seven months — and as a result, be able to donate 75 bikes to people in need. The exact route they plan to take involves the trio riding from the Mediterranean shores of Alexandria, following the Nile River through the mountains of Ethiopia, continuing across the equator through Uganda and Kenya, riding through the Serengeti and the Democratic Republic of Congo, and eventually finishing the journey across the southern desert to Cape Town, South Africa. Locos Ciclos has found a great deal of success — but what effects did their UCSB roots have on these adventurers? A primary source of inspiration was their love for two things: adventure and bikes. 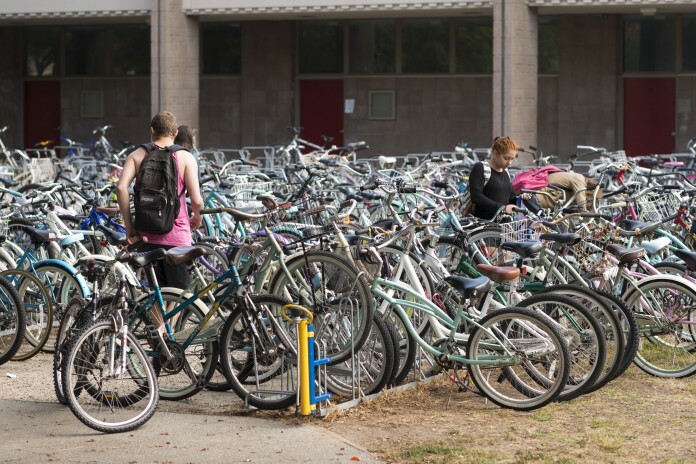 Constantly cycling at UC Santa Barbara, as well as being in the Excursion Club together, influenced the trio to give back to people who would benefit from owning a bicycle. Visiting the places targeted by World Bike Relief and talking with people who were gifted bicycles from the nonprofit were also huge motivators to continue their charity work. Roos-Collins noted that UCSB fosters an incredible mindset of pursuing adventure and that there are so many activities and ways to get involved at UCSB or in the community that all you need to do is “say yes.” Connell explained that going to UCSB impacted the way they thought about transportation because of how effective biking was around campus. Love for bike culture and being comfortable on bikes was a major reason he started Locos Ciclos in the first place. Lee added that he saw UCSB participate in a lot of efforts to be environmentally friendly, and remembers that biking was the easiest and most economical way to get around while he attended. When asked what they would want current Gauchos to know about the difference they can make, the trio were in agreement: current Gauchos should know that making a difference doesn’t have to happen all at once. It’s the small things added up over time; the same way that, on a bike, many small pedaling motions over time will take you further than a singular big push. Most of all, the Locos Ciclos embody the message that, utilizing the supportive community found at UCSB, you and your buddies can use your passion to make a difference. If you would like to track down Daniel, Quincy, and Byron and see where they are during their adventure as well as read blog posts, watch videos, and look at pictures of where they are throughout Africa, you can visit their website at LocosCiclos.com or follow their Instagram page @LocosCiclos. Based on the total budget and number of bicycles distributed, https://worldbicyclerelief.org spends about $267 per bike distributed (including fund-raising, management, training mechanics, …). So the value of the bike fundraiser is about $20,000, or less than $1000 a month per rider. It sounds like a nice vacation, but it isn’t a particularly productive fund-raiser.